Empire Life dedicates itself to helping you manage your money effectively with a selection of life insurance plans that remain affordable even as they help you maximize your wealth. Whether you want a simple plan with no frills, or you want to manage your insurance directly to build your future, Empire Life can help. Solution Term 10 or 20 years Ages 18 to 75 Renewable and convertible without medical exam up to age 75. Available with a critical illness rider. Solution 100 For Life Ages 0 to 75 Payments end at age 100 with level premiums. Cash value begins in the 4th year. Hybrid Solution 100 For Life Ages 0 to 75 Payments end at age 100. Premiums are adjusted annually to reflect Canada’s interest rates. Optimax Whole Life For life, or payable in 20 years Ages 0 to 85 Purchase additional insurance as you need it or use excesses to keep cost of insurance low. Ideal for estate planning. Vital Link 10 years, to age 75, or to age 100 Ages 18 to 65 Covers 23 critical conditions. Rates are fully guaranteed for the length chosen. Return of premiums on death if no claim is made. 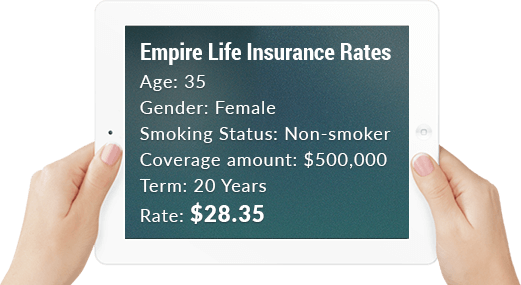 We are pleased to offer all life insurance products provided by Empire Life. For a quote on all available life insurance plans, please use our no-obligation quote provided on the right to explore your options and find the right fit for your needs.